Whether you're a beginner or intermediate lifter, you will quickly appreciate the firmness of the bench, the sturdiness of the power rack, the easy-to-handle weight plates, and the feel and strength of the barbell. 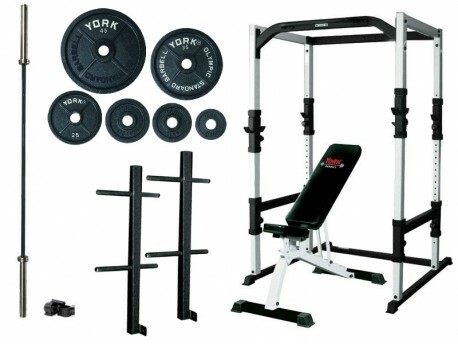 We've put together a quality package of equipment here that is all high quality and won't break the bank. The most versatile and safe setup for a beginner or intermediate lifter looking to gain muscle is a bench, power rack, and barbell weight set. We recommend this over a "bench press set" that is only good for one exercise, and some of the cheaper ones out there are made poorly and are unsafe. With this setup, in addition to flat and incline bench presses, you can also do other freeweight barbell exercises such as squats, military presses, calf raises, lunges, rack pulls, curls... all with the convenience of adjustable height bar holders and the assurance of safety catches when you need them to lift alone and count on it to catch a failed rep before the barbell crushes you underneath it. In addition, the rack includes a pull up bar, which is hard to see in the pic but is a straight bar that extends out from the brace on top. This setup also gives you the option of doing dumbbell exercises with the bench, or you can of course do barbell exercises like deadlifts outside the rack. The York Legacy plates have an old-school classic design and are calibrated to within 2% of the marked weight. The olympic bar is much stronger than anything in an "economy" weight set and has a 30mm grippy black oxide coated shaft. (2) York FTS Plate Storage Attachments - These attach to the rear of the left and right sides of the cage to hold all your plates. It's also easy to add options in the future to expand your home gym. The bench will be great for dumbbell work. You can add specialty bars for doing curls, tricep extensions, or hex bar deadlifts.